Get ready this summer for Argyle Feed Store’s May Specials and Promotions. You’ll save on a variety of items like Chuck It dog toys, animal wound care products, garden tools, flowers, work gloves, and plants. Check out the monthly and weekly specials below by clicking the links. Make sure you like follow us on our Facebook page as we will provide you updates on each weekly special. 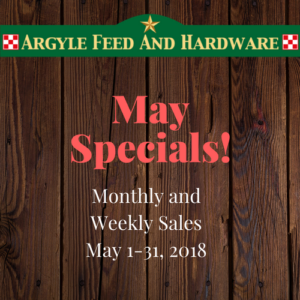 Stop by Argyle Feed Store this May and Save on our May Specials! This entry was posted on Thursday, April 19th, 2018 at 10:55 pm	and is filed under News & Updates, Specials. You can follow any responses to this entry through the RSS 2.0 feed. Both comments and pings are currently closed.